This one’s a crowd pleaser! 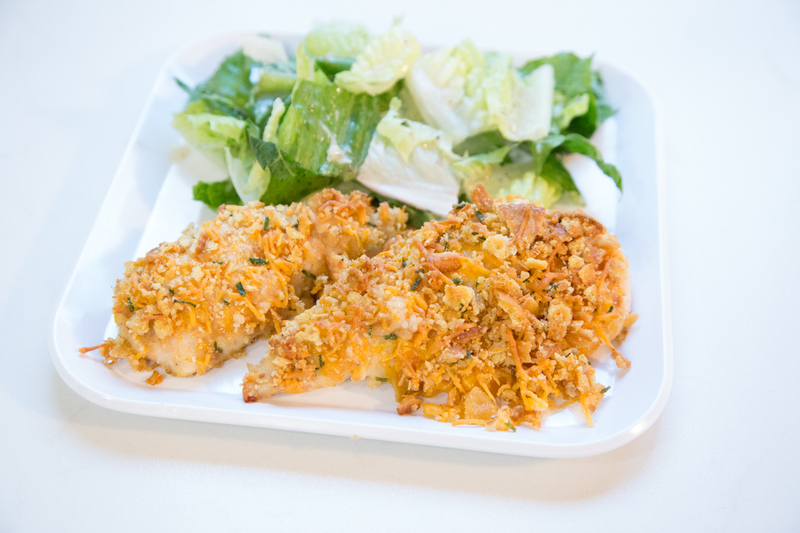 Our boys loved this homemade crispy chicken – with the buttery goodness of crushed Ritz, combined with tang from the cheddar cheese, a little garlic and a punch of flavor from fresh chives. It’s just a fabulous combo for chicken breasts! I pounded and slice the chicken breasts, but this same amount of crackers would work for 10-12 chicken tenders too! Melt the butter. Crush the crackers into crummy pieces. If needed, chop the chives. Lightly pound the chicken breasts to about 1/2-inch thick. If preferred, cut in half to make “tender” size pieces of chicken. In a small mixing bowl, combine the crushed crackers, shredded cheese, minced garlic and chopped chives. Place the melted butter in another bowl. Dip the chicken into the melted butter, then coat with the cracker mixture, and then place into baking dish. Bake in the preheated oven for 30 to 35 minutes, or until chicken is cooked through. Serve Crispy Cheddar Chicken Bake with dinner rolls and veggies.